I will go as far as saying these cookies are honestly the best shortbread cookies I’ve ever made and eaten! They’re just so moorish and literally melt in the mouth and always get devoured super quick! They’re absolutely packed full of white chocolatey goodness and are the perfect way to start your weekend with! Each bite is speckled full of vanilla bean, white chocolate chunks and will just crumble into pure deliciousness. I apologise in advance because they are SERIOUSLY good and once you’ve tried one bite you will become addicted…I guarantee that! 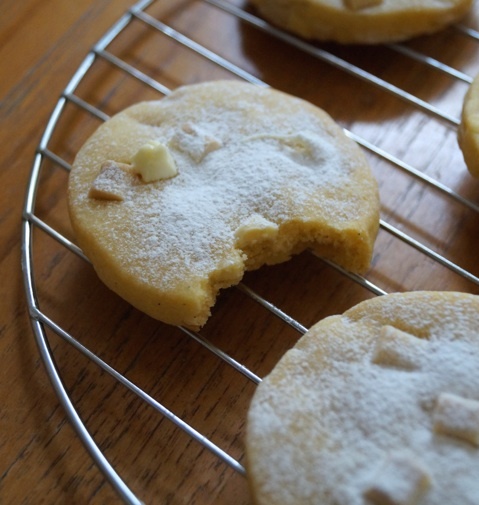 At first I struggled to describe these shortbread cookies. But they really are the epitome and pure example of heaven for me. 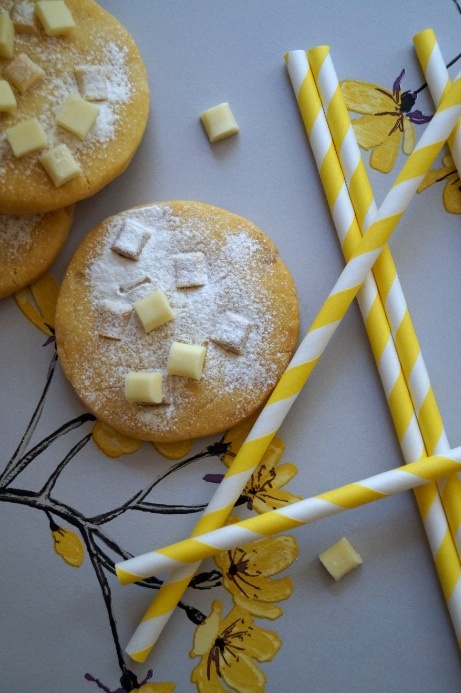 I’m so in love with white chocolate (or any chocolate to exact!) and vanilla. Two flavours that are mean’t to be put together. Plus, they won’t hang around long, I made these in the morning and simultaneously they almost all disappeared. Definitely a good sign when you’ve baked something! 1. Sift the flour, corn flour, custard powder and baking powder into a mixing bowl. 2. In another mixing bowl, cream the butter and sifted icing sugar and vanilla together until light and fluffy- about 2 minutes with a hand whisk or do it by hand with your elbow grease! 3. Gently fold in half the flour and start mixing into butter. Then add the other and mix until a dough comes together. Then gently fold in 70g of the white chocolate chunks. Once well incorporated, shape into a round. Wrap in cling film and chilli in the fridge for 20-30 minutes. 4. Once chilled preheat your oven to 180 degrees C. Line two baking trays with non-stick paper. Lightly flour a work surface, roll the dough out until it’s about 3 1/2 cm thickness. Cut out 5cm rounds from the dough and place on the baking tray. Scatter over the extra white chocolate chunks and bake for 10-12 minutes. 5. Cool on the trays for 5 minutes, then transport to a wire rack and finish cooling completely. Enjoy with a glass of milk for a great afternoon pick-me-up! 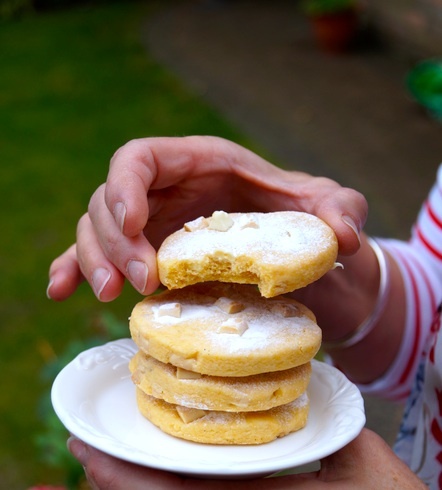 The cookies crumble super easily and by adding gives traditional shortbread cookies a little twist!